The roasting process, fine-tuned through years of experience, and the skilful mixing of Coffea Arabica and Coffea Robusta allow our product to preserve a quality and aroma which can meet any taste. It is indigenous to Ethiopia, where its cultivation began; it then spread to most tropical areas, from South America to India. The most common types are: "Moka", whose rather small beans have an intense aromatic scent and a flattened, elongated shape; "Tipica"; "Bourbon", very common in Brazil; "Maragogype", which is appreciated for the larger beans it produces. Arabica plants thrive in grounds above 600 m of altitude; the ideal average temperature is of 20°C. Its round beans are smaller, but richer in caffeine than the other species, and once roasted have an intense scent. This type also grows in plains. Discovered in Congo, now it is extensively cultivated, as besides ensuring a rich production it features a high resistance to diseases, and it can grow even in areas where conditions are less than ideal. 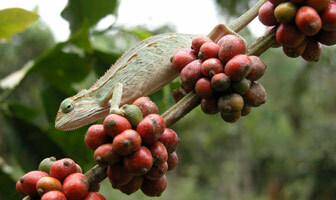 Some types, created through crossbreeding of the "Canephora", the species the Robusta belongs to, are very common in Indonesia, Uganda, India and in Western Africa. Roasting is performed using hot air, in a rotating oven keeping the product constantly in motion. Roasting may increase the product friability, making it easier to grind. It also increases its humidity absorption power; as a consequence coffee, especially when ground, must be vacuum-packed, or kept in packages containing inert gas. The caffeine content of the Arabica type ranges between 1.1 and 1.7%, while that of Robusta ranges between 2% and 4.5%. The balance of a perfect roasting depends on two variables: time and temperature. One needs great experience to be able to control these two variables and achieve a unique end result. We use Robusta beans from India and Vietnam, washed and cleaned, as well as Arabica beans from Brazil, Columbia, Costa Rica, Guatemala and Java. We then skilfully mix the different types to create our product lines.